We had the pleasure of having dinner at the famous First Growth estate of Chateau Lafite-Rothschild in the commune of Pauillac. Lafite is the hottest First Growth on the market these days, with prices in the stratosphere due to the Asian demand – even their second and subsidiary wines are commanding huge prices. You can tell there’s money here, the grounds (pictured) are immaculately manicured, with everything in its right place. From the reception held on the largest grounds of any visit on this trip, we strolled around and admired the scenery while enjoying the first class appetizers before being led into the cellars for a long ten minute walk. The barrels are held in a gigantic circular shaped cellar that reminds of something from the Roman times with its antique look, huge height and ornate pillars. The dinner reception was held in an highly decorated room with photographs of all the important people associated with Lafite past and present, including one of the Lafite representative sitting at our table, longtime General Manager Charles Chevalier (pictured below). A charming man who spoke very good English. Dinner for the 110 total guests was superb despite the heat (I sweated bullets in a suit), and the featured wines were exquisite, 1983 Lafite Rothschild (ever changing and so elegant and still young), and the dessert wine was a sublime and again young 1986 Chateau Rieussec (beaucoup de botrytis and exotic white fruits like peaches, nectarines and pineapple), both served from magnum. Sandwiched at the head of the event, we also had the pleasure to taste the wines from the other estates of Lafite Rothschild – including the very nice Chateau d’Aussieres from Corbieres (a Syrah, Grenache, Mourvedre and Carignan blend from Southern France), a superb Bodegas Caro (a collaboration between CAtena of Mendoza and ROthschild), and finally the Le Dix de Vina Los Vascos from the Colchagua Valley in Chile (in commemoration of 10 years of Lafite’s work in Chile). This was another memorable night..
My first question to Cellarmaster Roland Bruno was the pronunciation of the Chateau Leoville Las Cases, whether the ‘s’ in ‘Las’ was pronounced or not, and the answer is yes (albeit improper French), but apparently as it is a proper name, they can pronounce it however they want, and in the south of France, they do pronounce the ‘s’. Thus a long time question answered. There is a certain understated-ness about the three Leoville estates, none of the glamour of the First Growths, just vine growers going about their business – love the casualness given the quality of the wines. I very much liked St. Julien, reminds of heritage and history (although I did see the famous reverse osmosis machine). Everywhere we visited we were made welcome with open arms. One can arguably say St.Julien is the most consistent appellation in Bordeaux, with the highest percentage of Classified Growths properties of any region. What I liked is they all seem to get along and have nice things to say about their neighbours, which is nice to see. We sampled quite a few wines from the 2010 Las Cases stable including a wide open and already drinking beautifully Fugue de Nenin, a better made yet more structured and reserved Nenin, the fine Potensac, a not new but rarely seen in Canada Lion de Las Cases (the official 2nd wine), the Clos du Marquis (separate vineyards) and the 2010 Las Cases itself (big, bold, but not as big as the Leoville Barton I tasted at VinExpo) – certainly the structure is there but I expected a non-forgiving monster and this surprised me with its approachability. A highlight of the entire trip so far in Bordeaux (and there has been many) has been our visit to the St. Julien Fourth Growth estate of Chateau Branaire-Ducru. Proprietor Patrick Maroteauxand Manager Jean-Dominique Videau (pictured) gave us 2.5 full hours of their time to go through their vineyards, their cellars, and their estate philosophy – this kind of attention is a rarity when visiting Bordeaux chateaux and made me appreciate the Chateaux and its wines even more than I already did. One can certainly see their ascendency over the last decade in the Grand Vin, and how their philosophy for finesse yet still be representative of what a St. Julien wine should be is reflected in their stellar 2010, 2008 (really superb for the vintage), 2003, 2001 of the Grand Vin, which we tasted. As well, the improvement in the 2010 Duluc, their second wine is also noticeable. Patrick and wife Evelynare one of only three proprietors who actually live in their chateaux in all of Bordeaux. It was very nice of them to invite us into the chateaux for a ‘casual’ lunch of Pate de Canard Chaud, Poulet a l’estragon with truffle rice, Soupe de fruits rouges and Fromages affines, a quartet of cheeses from the cheese caves of world renown cheesemaker and affineur (ripener) Bernard Antony, who happened to be staying with the Maroteaux’s and he personally served us the cheese course. 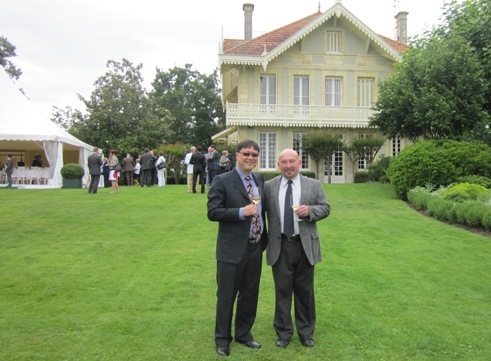 He was in Bordeaux to serve many a fine dinner for various famous Chateaux over VinExpo. You may have read articles about Mr. Antony, whose cheeses are sought by aficionados the world over. He has serves many famous clientele including Queen Elizabeth II and presidents and dignataries alike. Apparently 80% of France’s 3 Michelin star restaurants are supplied by him! He apparently has two caves full of cheese at his cave/cellar in Vieux-Ferrette, near Altkirch in southern Alsace. Don’t ask me what the names of the cheeses served were (I only remember the Comte that was mind blowing), but my, they were all so complex with superior texture, depth and flavor, much like wine. What a thrill and honor to dine with a recipient of the Ordre National du Merite! I would have taken a picture, but I resisted, it would have been imprudent to take a picture at the dining table when being served by a legend. One of my favourite and probably ever-lasting memories pertains to this Chateau (pictured below)..
What a way to start off the day but with a visit to the First Growth estate of Chateau Margaux in the appellation of Margaux. There is certainly a noticeable amount of grandeur associated with the big estates, the grounds are bigger, the vineyards bigger, the reception area bigger, even the parking lots are all a cut above the rest. Pictured above is the chateau itself and one of its cellar. I guess we now know where our patronage has been spent. Formality must be adhered to here, traditions respected – jeans and cutoffs and tardiness are a big no-no. A jacket for the men a requirement, and yes, bring lots of business cards. After a tour guided visit, we were privileged to be greeted by Paul Pontellier, Manager and winemaker of the renown estate for twenty years who tasted with us the 2010 Pavillon Rouge – very fine, not $100+ fine, but well made. The 2010 Chateau Margaux Grand Vin was closed in my book, but classy with cashmere tannins and a light footed yet full-bodied palette. Didn’t wow me I must say, completely impossible for me to evaluate at this young age – its not every day we get to taste a First Growth from barrel. I guess we’ll defer to the ‘time will tell’. Mr. Pontellier said they are open to new technologies but will only move to changes as such only upon thorough and rigorous trial and evaluation – on things such as biodynamics, stelvin enclosures, individual plot fermentation etc.. The house is mired in tradition – they employ a full time cooper who builds 20% of their own barrels (cooperage area pictured below along with Mr. Pontellier). We visited Chateau Angelus (btw, the ‘s’ is pronounced), a St. Emilion Grand Cru Classe B and met briefly with owner Herbert de Bouard de Laforest. One of the wine’s claim to fame was its appearance in the ‘007’ Casino Royale movie where Daniel Craig’s James Bond drinks the Angelus. The story was that current series producer Barbara Broccoli, the daughter of former longtime producer Albert R. Broccoli, said her father adored the wine, so she decided to add Angelus to the now famous train scene where Bond dines with Vesper Lynd, played by Eva Green – apparently Barbara requested 5 bottles of the 1982 to shoot that scene! claiming James Bond only drinks the very best – alas the 1990 wasn’t even good enough! As an aside, it may be a one time appearance for Angelus, as the recently released new James Bond novel ‘Carte Blanche’ penned by American author Jeffery Deaver has 007 drinking a South African wine – the Warwick ‘Three Cape Ladies’. Known as Chateau L’Angelus until 1990 when the L’ was dropped, this estate has a similar blend to the famous Cheval Blanc, roughly 50-50 CabFranc and Merlot (there is a tiny bit of CabSau planted). Note in the picture above of the vineyard with our tour guide and winery consultant Laurent Benoit that there is a naturally gentle slope of this one contiguous plot of vines that helps with drainage down to the CabFranc located at the bottom of the plot which needs the moisture. Ran for seven generations by the Bouard de Laforest family, (Herbert’s father is 89 and lives in their neighbouring estate of Bellevue), the Angelus name refers to the three Angelus bells audible from the vineyards, coming from the chapel at Mazerat, the church in Saint-Martin de Mazeret and Saint-Émilion. Amongst all this trivia, we managed to taste the 2007 Bellevue (very good and ready to drink), 2009 Bellevue (a much better bottling) and then the 2009 Angelus (exceptionally inky, voluptuously creamy). At VinExpo, the beautifully articulate blue and blackberry driven 2010 is a twenty year wine that will require more time than the 2009. The wine is expensive certainly, but worth it. About 4000 cases of Conseillante are made each year from vines averaging 40 years of age and cropped very small to control the volume, around 4000 litres/hectare. Planted in 80% Merlot and 20% CabFranc in one contiguous block of vines, this is an elegant expression of Pomerol, never the boldest nor the lightest of wines, it is all about finesse and class. We were treated to the superb but tight 2005 and an already exquisite 2010 from barrel that will rival the superb 2009 (have we heard this before?). 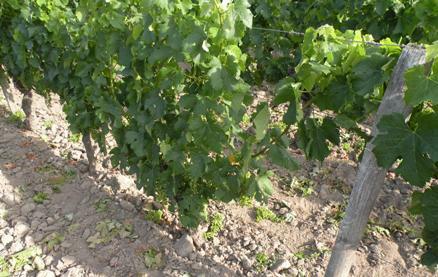 They had just started the green harvesting at the vineyard (pictured), and we saw bunches left lying on the vineyard. Jean-Michel confirmed earlier reports that the vintage 2011 is about 2-3 weeks ahead of schedule and picking will be one of the earliest in history. The price has crept up slowly but steadily over the years to catch up with the other superstar neighbours. For the Merlot lover, this is a must experience wine. 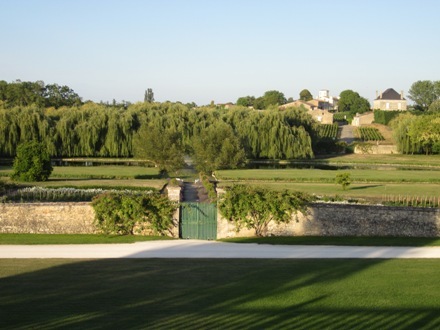 With 75 hectares in 3 plots, the vineyards are well exposed on a chalky slope at the south end of St. Emilion. The main wine is well priced and adored by Scandanavians (who were the previous owners before Magrez). There is a small production garage wine, the Magrez-Fombrauge ultra-premium and there is the very good and inexpensive 2009 white St. Emilion (one of only three in the entire region) which we tasted that was lovely with great exotic tropical fruit and bright citrus acid (quite different from the mineral driven whites found in Pessac Leognan). We tasted the 2007 Fombrauge Rouge that was beautifully made and makes a case for drinking your 2007’s right now whereas the 2010 tasted from barrel was more structured and in a different quality plane – this is an excellent QPR wine. Well, here’s one for the ages. Myself, Marc Vigneron of Nobilis Wines (pictured with yours truly, who supplies all of deVine’s right bank Bordeaux futures) and David Dienger of Zyn in Calgary were amongst the 90 guests invited to a special VinExpo lunch at the home of Christian Moueix (of Petrus, Lafleur Petrus, Trotanoy, Hosanna, and Dominus fame). We started with a barrel sampling at the Libourne estate with the 2010 Magdelaine, Belair-Monange, Latour a Pomerol, Providence, Hosanna and Lafleur-Petrus in that order. The latter was simply AMAZING! (freshly picked flowers, and a liquid velvet palate that lingered on and on) and a must buy for the vintage, and the others were nothing short of pretty stunning themselves! Then we drove up to Mr. Moueix’s beautiful home, where we were led into a tent to start things off with a vertical of Chateau Trotanoy, vintages 1998, 2000, 2002, 2005, 2008 and from barrel, the 2010. The 2002 surprised us by drinking the most beautiful of them all at the moment, while all the others required more time. The 2010 is special and will be ranked alongside the already legendary 1998 which showed the most power of the entire flight. From there, we were led to the entrance of the courtyard next to the home and met with Bollinger Champagne before officially being greeted by Christian and his wife Cherise, son Eduardo, long-time legendary winemaker Jean-Claude Berrouet, and we then sat at the lucky #8 table where I got the pleasure to sit next to Michel Gillet, the estate manager for all the Moueix stable of estates since the late 1960’s. Despite my no doubt bambling and broken French, we managed to carry on a conversation about the Moueix estates, great vintages (he considers the greatest Moueix vintages of the last quarter century to be the 1982, 1989, 1998, and 2009) and the fact that great wine is meant for drinking and that the 2011 looks like will be the earliest picked vintage since 1893! To the best for last, the four course lunch was prepared by none other than the legendary chef Michel Guerard, the founder of nouvelle cuisine, and the owner/proprietor and chef of the famous Les Pres d’Eugenie which has garnered and maintained their three Michelin stars standing since 1977! Without doubt, the most amazing lunch I’ve ever had and the food I must say overshadowed the exquisite but young 2005 Hosanna, and a pretty stunning and drinking beautifully 1998 Lafleur-Petrus, both served from magnum. Enough superlatives, but a priviledged day indeed and totally unforgettable. I feel honored and humbled to be invited, thank you Marc! Back to the madness at VinExpo, it is flabbergasting to see the number of people here. The traffic congestion into Bordeaux is a nightmare, we would have waited an hour to get into pavilion parking. Instead, we parked afar and walked for 10 minutes to the show. We visited with Fernando van Zeller of Vinihold, the famous Portuguese producer and negociant and tasted wines from several states he represents. Two that stood out to me were the Quinta do Alorna, established in 1723 and since 1958 has produced wines of quality from its 250 hectare estate. With a much more fancy reworking of the labels and a very good line of wines from top to bottom, it is a well-priced and well tuned estate that we should keep an eye on. I was really impressed with its brand new ultra premium wines, the Marquesa de Alorna. The 2008 Red and the 2009 White are secret blends which were outstanding and ageworthy – which we tasted with winemaker Marta Simoes Reis. I tried but could not get any information about the varietals and percentages in either of these two high end blended wines that come beautifully packaged in a 3pack wooden box configuration. Guess you’ll just have to taste them for yourself when they come into the province later this year. We finished the tasting with a new range of Barao de Vilar ports, including an electric and unfiltered 2001 LBV late release, and an exquisite 2003 Vintage Port. Ah, my tongue is black and my teeth blue these days..
We visited Thierry Lurton and his lovely wife, the Comtesse Solange de Ravinel at Chateau Camarsac for an outdoor barbecue tonight. Located between Bordeaux and St. Emilion, stands Entre-Deux-Mers, the castle known as the ‘castle of the Black Prince’ has vineyards dating back to the 1400’s. Despite its Bordeaux Superieur status and located in the heart of Bordeaux, we were treated to a dinner of grilled Canard, Saucisse de Bordeaux, roasted potatoes in duck fat, cheese and ice cream. We tasted the 2005 Camarsac from magnum and it was delightfully delicious and showing extremely well. To say I’ve gained weight since my arrival in France is an understatement – the bread alone is enough to put on a few pounds. Back to the huge and ancient Chateau, we were brave enough to climb up the circular staircase to garner a view from the top. Thierry comes from the famous Lurton family (his sister Berenice owns Chateau Climens in Barsac, cousin Andre owns La Louviere, and Pierre is the Director of Cheval Blanc and CEO of Chateau d’Yquem). Thierry is his own man and puts the vines and vineyards at the forefront – he has decided to put own various cuvees (including one called ‘The Black Prince’ from his various plots to showcase each unique terroir.